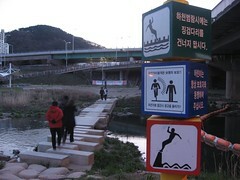 A few years ago $900 million was spent creating a 6km recreational space along a stream in central Seoul. I've visited this urban renewal project 'Cheonggyecheon' ('청계천') and it is quite beautiful, although as its Wikipedia page suggests, it has not been universally welcomed. 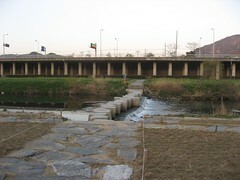 It's possible that since then Korea has developed an obsession with rivers, streams and even canals, though perhaps it had one even before 'Cheonggyecheon' was completed. There's even a development proposed for our neighbourhood which involves creating an artificial stream with bridges running the length of the district. Everyone, it seems, wants a little bit of 'Cheonggyecheon'. 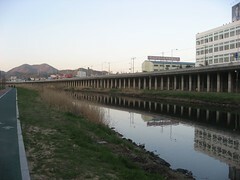 The Suyeong River ('Suyeongcheon'/수영천') in the Banyeodong area of Busan is not quite so picturesque, but this hasn't stopped part of the area around it being designated as a 'park'. 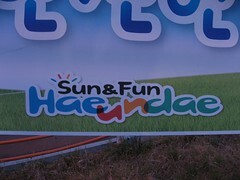 A 'park' elicits certain imagery for an English person. The Victorians, stifled by industrial pollution and in a last gasp of the grandeur of empire, built quite a lot of them, generally squarish in shape, generally complete with ornamental ponds and statues of lions evoking notions of far off conquests and British dominance. These days, except on the sunniest of days, they're primarily the domain of drug-users and knife-wielding youths, and as such, have retained their national metaphor. In Korea, a park is a much more fluid term, seemingly covering almost any public area within a city that hasn't succumbed to urban sprawl. Which usually means they are to be found somewhere it would be too difficult or undesirable to build. 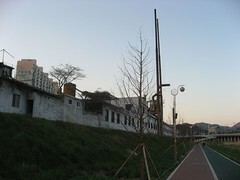 So to call the Banyeodong river development a park by British standards would be a stretch - it is essentially a couple of paths either side of a river nestled between two busy roads, featuring a small recreational area, some public exercise equipment, a vegetable patch, a decaying factory, and a couple of potentially dangerous river crossings. But you have to take what you can get here I think. 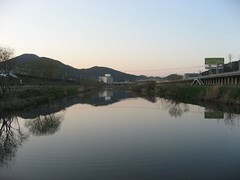 I used to enjoy running when I was younger and have often thought about taking it up as part of my efforts to keep fit, but it isn't really safe to go out running alone early in the morning where I'm from, and in Korea, it's a question of finding a place. 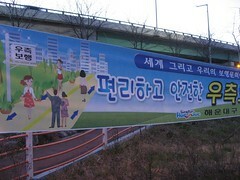 Like most of Korea, Busan is quite mountainous so the flat areas between the peaks tend to be heavily built up. Running along the main roads never looks healthy because of the heavy traffic fumes, frequency of junctions, people, and motorcyclists treating the pavements/sidewalks as a road. Away from the major roads, there aren't even any pavements so you take your chances with the traffic weaving in and out of the streets. It's not conducive to picking up a sustained pace. 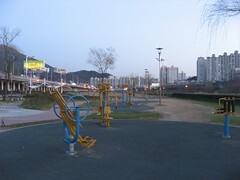 So if I sound underwhelmed about the park in Banyeodong, you have to understand it is a small oasis of possibility in an unforgiving urban landscape, and I wish we had something like it near our apartment. Perhaps one day the local government will build a stream for us, as promised. 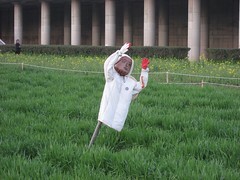 I recently read an interesting paper on "geomancy" (or Pung-su) in Korea. It's basically the same idea as Chinese Feng Shui or Japanese Fusui. It was premised on the conception of the earth as a physical body, which has a core of energy that makes it function and which has bodily systems for the distribution of the energy to the various limbs and organs, and so on. According to the body metaphor, flowing water was like the system of arteries in the body, dispersing energy throughout the earth as the arteries disperse blood. 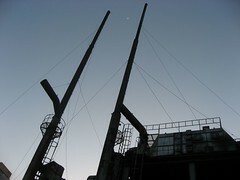 Mountains were also conduits of energy, seemingly analogous to sinews and muscles. Also, it was from mountains that flowing water has its source, so there was a sense that mountains are the gateway to the energies deep in the earth. So it's very interesting to read about the creation of new water ways like this. I also read that standing water is considered a negative energy, whereas flowing water is considered auspicious... very interesting~! I have enjoyed reading your comments. You have had some bad experience with your government and I know how frustrating that can be. I hope your health improves and I wish you a lot of luck, the good kind. Zephyr - I suspected the reason behind it was something buried deep within the Korean psyche and I think you might be right about the geomancy. This probably explains why my mother-in-law doggedly keeps the water feature in her lounge even though it's prone to occasionally spilling large pools of water over the floor! Thanks Basefare. There's a famous quote, "people get the government they deserve", so maybe we did. I once played my part in the minor leagues of British politics - I had the chance to go further, but to what end? I believe we needed real change, and the system wasn't going to allow that, and all I would do is waste my life betraying my principles. Perhaps I deserved what I got because I believe my country needs people like me, but we walked away from the fight because we grew tired of it. This year, the British Government gave itself the power to open everyone's mail 'for tax reasons'. I have family who served in World War 2. I'm sure their sacrifices made a better world for us all but it seems that the individual liberties they fought for are being eroded. We are going down a dangerous road. The intransigence and disrespect I encountered from my Government is the way of the future I sadly suspect. I don't know what to do. Thank you for the good wishes regarding my health. There are many people less fortunate than myself so I'm thankful for what I have, even if it is less than perfect. Reading your blog I see you have your own health challenges and I wish you the very best of luck with those. Thanks, Mike. I have added you to my follow list so we can stay tuned and keep up with what's happening. I guess we have to play the cards were dealt. Regarding politics, there comes a time when we have to turn it all over to a younger generation. Still, politics will always remain a topic for conversation, good or ill. Hang tough. Best regards.